The Cover Guy have updated its hot tub cover lifter buying guide. Everything your need to know to choose the best hot tub cover lifter. A good hot tub cover can weight from 50 to 75 pounds, so it can get really hard to move on your own. That is why we recommend a hot tub cover lifter. In this article, you’ll know more about the advantages of a cover lifter, the things to consider when you’re looking for a cover lifter, how a hot tub cover lifter works, what are the choices of lifters, and more. Why to Buy a Hot Tub Cover Lifter? 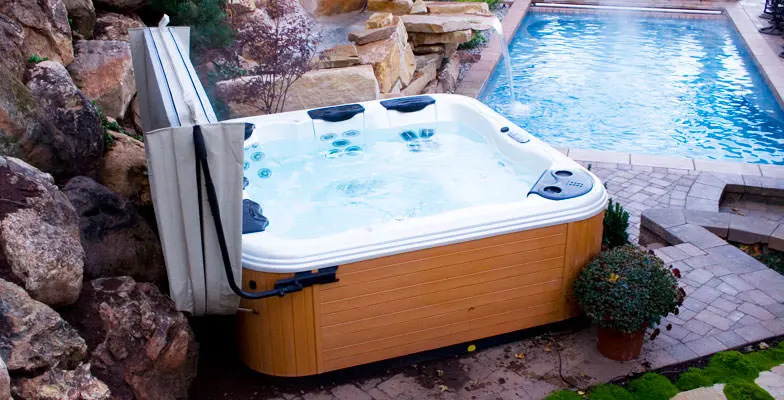 Essentially, if you choose the best hot tub cover lifter for your situation, it will make your life easier by easily sliding your hot tub cover on and off your spa. Enjoy your hot tub even more! The first thing you need to look at when looking for the best spa cover lifter is the space you have around your hot tub. 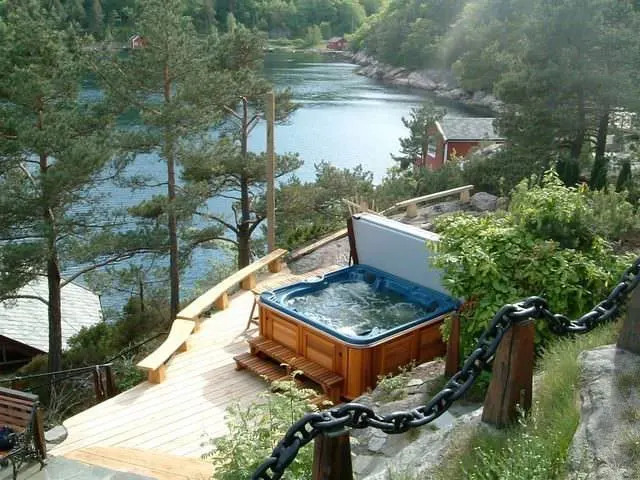 Some lifters need more space than other, so we recommend you note the distances you have between your hot tub and any obstacles, whether it is a fence, a tree or a wall. The Cover Guy has a great hot tub cover lifter guide on the side and back of the hot tub for each type of lifters. Different models of lifters have their own, unique restrictions for what hot tub covers they will work with. In particular, you need to be aware that the size and shape of your hot tub makes a difference. Some lifters only work on round covers while others only work with square or rectangular ones. Some lifters are able to accommodate more than one shape. Lifters also have very specific minimum and maximum cover sizes that they can be used with. Most lifters will work with spas that are between 76” and 96” in diameter. There are lifters for larger covers, but they are harder to find. The type of mount you need may depends on how is your hot tub installed : is your spa on a deck or a patio, is in-ground or stand-alone? The type of mounting you choose depends entirely on how much clearance you have on the various sides of your tub. If you have more than one option available, it comes down to a purely aesthetic choice. They all work equally well. Tip : If you live in areas where there are snow accumulations, we recommend you to choose a hydraulic hot tub cover lifter. Your cover will be easier to remove and replace when there’s an accumulation of snow or ice on top of it, and it will speed the process of entering into your hot tub when it’s freezing outside. Click here to know more about how to install your hot tub cover lifter. Hot tub cover lifters can be mounted on your hot tub in a number of ways. Bottom mount lifters : the lifter is attached to your hot tub at the bottom – either on the rear or on the sides. Side mount lifters : the lifter is fixed to the top of the sides of your hot tub. Back mount lifters : the lifter is placed behind your hot tub and need no space on the sides of your spa. Under mount (or deck mount) lifters : lifter is attached to a metal plate that sits under your hot tub or is bolted to a deck. This avoids the need to drill holes in your tub housing. Some lifters are adjustable so they can be placed anywhere on your hot tub. The difference between each type of lifter is clearance needed, ease of use, and cost. First, the manual pivot lifter is perfect for those with little budget but want to remove their hot tub cover more easily. To remove the cover, you’ll have to fold it in half using the metal bar in the middle of your spa, then lift it upwards and push back. 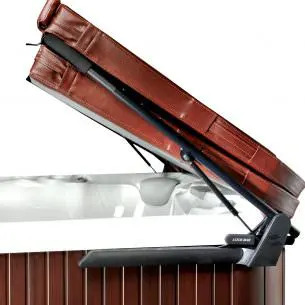 This type of lifters is flexible so it can fits almost any shape and size of hot tub, and it can be mounted on either the bottom, sides or back of your spa. Even if it is the cheapest option, a cover with a good manual pivot should be easy to remove using one person only. 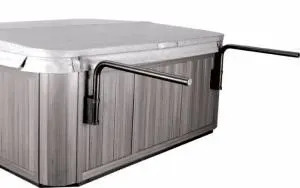 Then , the hydraulic hot tub cover lifter is probably the best spa cover lifter available, yet the more expensive because it do almost all the work for you. You’ll have to fold the cover, but simply guide it up and back, no force needed. Hydraulic lifters come with many optional features, so you’re likely to find one that suits your needs. This type of lifters is adjustable so it can fit just about every hot tub in every emplacement. Finally, the shelf hot tub cover lifter is the cheapest option, but it doesn’t take any of the cover weight for you. This is simply a shelf fixed to the back or sides of your spa where you’ll put your cover while you’re in the hot tub. Rather than lifting the cover off of the tub, a shelf removal system allows you to fold the cover over and then slide it off the hot tub and onto the shelf. Sometimes, rollers can be added to help you push the cover unto the shelf. This is a good option if the weight of your cover isn’t a problem for you. This kind of lifter needs a lot of clearance around your hot tub, so make sure you know your distances. If you choose that option, we recommend you choose a shelf that can fold towards the bottom to clear the entire space of your hot tub. Hot Tub Cover Lifters are a vital addition to your hot tub, making it the heavenly place it is intended to be. If you need any other information about the advantages of a cover lifter, the things to consider when you’re looking for a cover lifter, how a hot tub cover lifter works, or what are the choices of lifters, feel free to contact us! We hope this hot tub cover lifter buying guide is helpful in your pursuit of the best hot tub cover lifter. Keep on enjoying your hot tub with a lifter addition.